It’s the moment we’ve all been waiting for: the big reveal of the 2011 VPI Hambone Award® Winner! More than 4,000 votes were cast by the public for the nominees, but only one pet could reign victorious. Winning the hearts of more than 1,800 supporters, the title of VPI’s Most Unusual Claim of the Year goes to Harley the pug! Harley, who ate, and subsequently passed, more than 100 rocks, is the third recipient of this annual award. The race this year was tight, with Chico the Chihuahua (who almost became supper for a hungry owl) nipping closely at Harley’s heels. 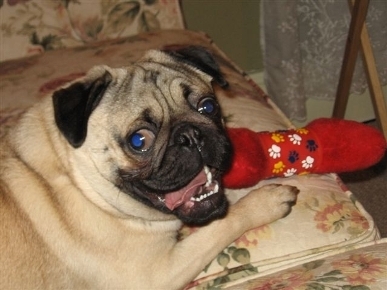 However, the pug’s rock-eating incident captured the most public votes, earning him the coveted title and claim to fame. Harley earned his nomination back in June when his owner, Lori Laverdiere of Manville, R.I., discovered that her pug was experiencing some unusual bowel movements. After picking Harley up from the veterinarian’s office after a trip out of town, Lori took Harley for a walk and noticed that his stool consisted entirely of rocks. She could feel several small stones in Harley’s stomach and his condition worsened until he could no longer eat or drink without vomiting. Lori rushed Harley to the emergency animal hospital where X-rays revealed that he had ingested more than 100 small rocks, clogging the pug’s entire intestinal tract and filling half of his stomach. Fortunately, the rocks were small enough for Harley to pass without surgery. He was kept overnight at the hospital where the veterinarian administered medication to help him expel the stones. Within a couple of days, Harley made a complete recovery. 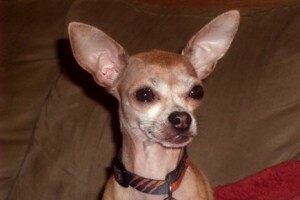 Second Place – Chico the Chihuahua (Crystal Lake, Ill.). This 4-pound Chihuahua found himself caught in the middle when a Great Horned Owl challenged his owner to a game of tug of war using Chico’s leash. 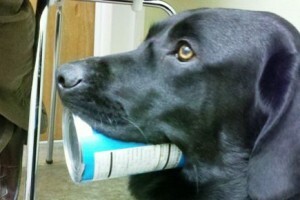 Third Place – Stella Artois the Labrador retriever (Ramsey, N.J.). While a healthy serving of vegetables is generally encouraged, Stella learned there are exceptions to every rule. 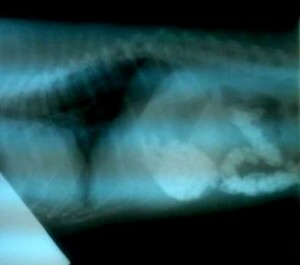 This pup’s dumpster dive for green beans left her with a tin can lodged firmly on her jaw. The 12 nominees were chosen from the more than 1 million claims VPI receives annually. They were considered along with other uncommon medical claims and selected by VPI as the most unusual of the bunch. All pets considered for the award made full recoveries and received insurance reimbursements for eligible expenses. On behalf of all of us here at Veterinary Pet Insurance, congratulations to Harley the pug and the rest of the 2011 VPI Hambone Award® nominees!